Each drum is multisampled with both left and right hand grip, from soft to hard hits. For example, the snare consists of 10 different hits from soft to hard with both left and right hand grip. In addition to that; 10 hard left hand hits, all with a slightly different approach + a variety of useful hits such as rolls & sidestick. We`ve also included all these hits without bottomhead snares on some. All cymbals are also multisampled with different types of hits. Each sample has 2 different stereo samples, one is the drum itself (with all the other mics turned on) and the other one is the room/ambient mics. 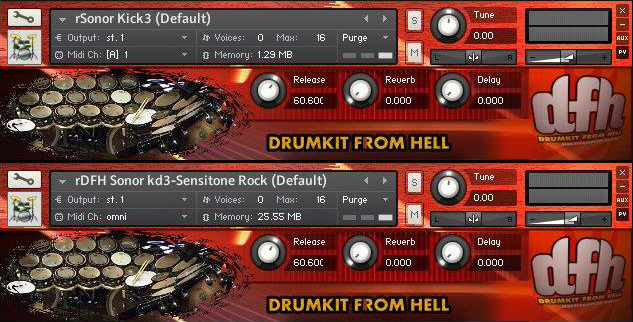 With this feature you're able to process the closely miked sounds and the ambient sounds seperately and create a wide variety of general drumsounds. Just Imagine the possibilities that'll bring to you!!! !